When it comes to great dental care, you can put your trust in us. Serving patients in and around Orland Park, we offer state-of-the-art restorative dentistry as well as a full array of general and cosmetic procedures. Many patients comes to the practice complaining about toothaches and jaw pain. That's often the sign of teeth grinding, also known as bruxism. Let's go over this dental problem in a bit more detail. Teeth grinding refers to the gnashing, clenching, and shifting of the teeth that occurs when a person is asleep. When this happens, it can lead to tooth damage, pain and discomfort, and even issues with gum health. Teeth grinding is a rather common problem, with as many as 40 million Americans dealing with some degree of this problem. When it comes to treating teeth grinding itself, there are a few common treatments to consider. Bite Guards/Night Guards – Worn during sleep, a night guard helps prevent direct contact between your upper teeth and lower teeth. This reduces the amount of damage done to the teeth themselves as well as reducing pressure and tension on the jaw joint. Stress Management and Relief – Since stress is a major cause and contributing factor to many cases of teeth grinding, stress management and relaxation techniques are a great option to consider for reducing problems with teeth grinding. Orthodontic Treatments – When teeth grinding is the result of poor dental alignment, the best option to consider for treatment is orthodontic care. Improving the overall alignment of the teeth can reduce issues with bruxism and other dental health errors. Of course, it's not uncommon for a combination of treatment options to be used as needed. 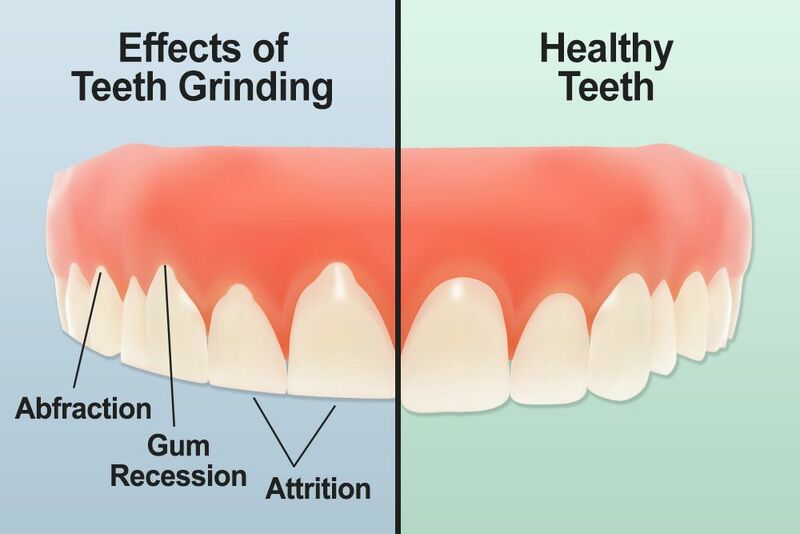 Teeth grinding can do a lot of damage to various structures of the mouth. There are different restorative procedures that can help out in these situations. Dental restorations can treat tooth damage, for instance, and gum recession can be dealt with through the use of grafting procedures. If teeth grinding causes a TMJ disorder, there are different treatments to address issues with jaw joint alignment. As with the treatments mentioned above, combinations of procedures are not uncommon. All treatments will be tailored to specifically address your dental care needs. For more information about teeth grinding and how we can help you smile with confidence again, be sure to contact our cosmetic and restorative dentistry center today. Our team looks forward to your visit and discussing these matters with you in grater detail.